is a 2.3 kilometre public park built on a historic freight rail line elevated above the streets on Manhattan’s West Side in New York City. The design is a collaboration between James Corner Field Operations, Diller Scofidio + Renfro, and planting designer Piet Oudolf. 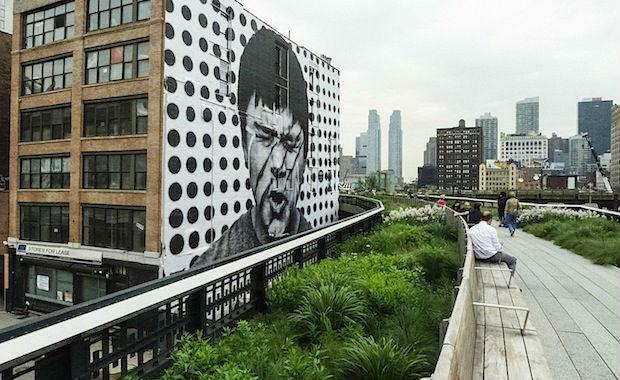 The High Line's planting design is inspired by the self-seeded landscape that grew on the elevated rail tracks during the 25 years after the train tracks were decommissioned. Features such as the sun-deck, landscaping, water features and ambient led light for nighttime, contrasts the New York City environment and draws the community to enjoy the space. A public greenway in Sydney’s Ultimo consists of 500 meters of public parklands that will be transformed from the 1854 Goods Railway line. Sydney Harbour Foreshore Authority is leading this whole-of-government project. The urban corridor will provide a thoroughfare for pedestrians and cyclists as well as a variety of interactive spaces. The features include commercial outlets, study pods, digital screens for entertainment, public seating, a stage and an amphitheater. It will further connect the arts, education and cultural institutions along Sydney’s Cultural Ribbon. The Goods Line North is the upcoming stage of a larger project. The next stage will be to redesign The Goods Line South, which runs from Ultimo Road underbridge through to Railway Square. The Goods Line North is approximately 250 metres long and extends from Ultimo Rail underbridge to the Powerhouse Museum, running parallel to Harris Street. Work on The Goods Line North will begin in March 2014. Designed by Aspect Studios, construction has started and is due to be completed by 2015.
proposed park is located in the former Williamsburg Bridge Trolley Terminal. Designed by James Ramsey of Raad Studio, the 4,046 square meter site is located completely underground. The design uses solar technology involving the creation of a “remote skylight". In a neighbourhood with the least greenery in the city, this technology allows the space to be used as a park and to be landscaped with real plant life. Scheduled to be completed by 2017, and to be open to the public by 2018. The Rotterdamn Climate Inititative has driven this project to turn old elevated train track in downtown Rotterdam into a commercial strip and elevated park . The roof scape was assigned to Deopel Strijkers for an environmental purpose, to integrate the city’s heating. The plan to turn an old elevated train track in downtown Rotterdam into a commercial strip and elevated park, has an ingenious twist. The plan integrates city heating into the design: industrial waste heat will be used to warm the pre-war buildings along its trajectory, radically reducing their CO2 footprint. The first stage of the proposed 4 kilometre public park was completed in 2011. The 606 linear park will be the first of its kind in Chicago. Designed by landscape architecture firm Michael Van Valkenburgh Associates trail is predicted to be opened during 2014. The urban development will feature 4.3 kilometres of pedestrian and cyclist access and a total of 5.3 hectares recreational space. The conversion of the elevated Bloomingdale Line into a trail and park provides unprecedented connections to and among these communities. Built atop abandoned railway lines like so many inner city parks, the Bloomingdale Trail had its inception in the 1990’s. Preliminary estimates put the total cost at $95 million. The team has already raised $46 million towards completion of the project, including $43 million in public funds and $18 million in private donations. pledged to open of The 606 within his first term, and the first phase of project, including landscaping, will open in June 2015. Construction began on the Bloomingdale Trail in August 2013.